As I read Debby Irving’s Waking Up White, (review here) her account of “waking up” to how her own white privilege, and the greater societal systems created to give white people advantage over people of color, shaped her perceptions of race and the way she interacted across color lines, I couldn’t help but take a look at myself, and the actions and inactions I have made, or not made over the years. One action popped into my head that happened over thirty years ago–gosh, I feel old–when I was eighteen years-old and a freshman in college in Boston. At that time, Boston was still very racially divided, and had been dealing with high tensions due to forced school busing laws that had students from the white neighborhood of South Boston being bused to schools in the black neighborhood in Roxbury. To say those two neighborhoods did not mix it up peacefully would be an understatement. I remember black people, and white people themselves from “Southie” as South Boston was called, say that a black person could not walk through that neighborhood without getting beat up. On the other hand, Roxbury was thought to be the “dangerous” impoverished black neighborhood, unsafe for any white person to hang out in. Still, I was not deterred. My roommate Donna, a punk-rocker from Long Island, and I would take turns accompanying one another to clubs–her dressing me in black spandex and torn tee’s for trips to The Rat, Boston’s premiere punk club in Kenmore Square, and me taking her to places like Celebrations, a disco across the street from The Rat, and to smaller, “black” dance clubs. One night after being at a black dance club, Donna and I took a ride with two young, black guys we had met there. Once in their car we drove around downtown Boston, and then through Roxbury. At one point we pulled over outside a convenience store because one of the guys wanted to buy cigarettes. I needed cigarettes, too. “I’ll get your cigarettes for you. You can stay in the car,” one of the guys said. “No, I’ll go with you. I want to go in the store,” I said. “No, you should stay in here. It’s not safe for you to get out…white people aren’t usually out around here,” he said, gently, but with a matter-of-fact tone in his voice. “Well, that’s all right, there shouldn’t be anything wrong with white people and black people being together…I’m not afraid..,” I countered, a combination of a few drinks and the true belief that I had something to prove…that we should all be able to mix it up across races without hate or fear. Today, thirty years later, after doing some waking up of my own, and after reading Debby’s book, I can see how my show of boldness wasn’t all so selfless, and didn’t exactly show respect to black people, in particular, to the young black man who asked me to stay inside the car while he went inside the store. Since all of the recent bringing to light of the killings of young black men and boys at the hands of civilians and police officers, I have had the time to hear from many black mothers of sons, and fathers too on the subject. I have heard friends of color, and strangers express how they had to have the talk with their sons, nephew, grandsons, which for white people usually means, the how babies are made talk. The talk is mothers and fathers telling their black sons to be careful when they are out in public, to not attract attention while out walking or driving while black. How to always acquiesce, speak politely, show your hands if pulled over by a police officer–things white boys don’t have to get told to do by their parents. The F.B.I.’s investigation of the Ferguson Police Department finally puts out there the racial bias that black men and boys experience far more than their white counterparts. But, it’s not only encounters with the police that get talked about. I have had many black mothers share that they talk with their sons about being with white girls and women in public. That they should be careful they don’t get accused of any wrongdoings by people who can’t fathom the idea of black men and white women having a positive friendship or romantic relationship. That they are a perceived threat. Back outside of that convenience store in Roxbury thirty years ago, when racial tensions were at an all-time high, maybe that young man thought that being seen with a white woman could be a dangerous thing for him. Maybe he thought I was putting him at risk. Maybe he did worry for my safety, too. Maybe it was an unsafe area, or maybe someone would be angry seeing a young white woman with a young black man. Maybe, just maybe, I should have listened to him, and respected his wishes to stay inside the car instead of being the self-righteous white person forcing the situation for my own selfish reasons. It was as if I was saying that he didn’t know what he was talking about. I invalidated his experience of being a black person who grew up in Roxbury, and who knew what racism meant there. I didn’t. I was wrong. I should have listened to him. That’s one example, which seems like something small, but it’s pretty big if we think about it. And, if this is just one, I know there are many, many more times I’ve acted in a way that I thought from my white perspective was the “right way” to handle race relations. I’m learning the right way is to validate a person’s experience, and not try to twist it to serve you. The right way is to have the courageous conversation where both people truly listen to each other, ask questions, and understand one another’s perspective so that we can make those connections across colorlines where black people and people of color feel validated and like white people really do want to understand, do want to chip away at the systems of racism that afford white people privilege, as well as the bigger systems of oppression, and move forward together in positive ways. That’s what I learned about myself and that car ride through Roxbury thirty years ago. I’m thankful that it’s never too late to learn. This is wonderful Wendy. It is never to late to learn and even better when those lessons get shared in the name of collective discovery and growth. Just as my story struck a chord with you, I hope your writings will strike a chord with white people who are often surprised to learn just how our socialized entitlement can be. Keep it going! Debby, you and Wendy Jane are just the very greatest and the absolutely the best, and the very, very epitome of overall awesomeness, my dearest and darling white sisterfriends who you both are so, so very much as the incredibly amazing, wondrously wonderful white women who you are both so, so very much For Always so,so very much indeed!!!!!!! Very much indeed, sisterfriends, it is never ever too late to learn!!!!!! Thank you very much, Debby for reading and sharing your thoughts here. Let’s hope so–that your book, my writings, our conversations will strike that chord. I will keep on going for sure, and thanks for clearing the path for me and others to further our journeys. Hi, there, my so, so very sweet white friend and sister, Wendy Jane!!!!!! Oh, my so, so very precious and dearest white sisterfriend who you are For Always so, so very much, Wendy Jane, I so absolutely loved this so brave and full of such honest integrity blog post article of yours, my precious and dearest white sisterfriend!!!!!! I just loved this!!!!!! You are just so courageous and and honest in your self-reflection when you were a lot younger and throughout your life, sister!!!!!!! It is so okay and natural and normal to make mistakes, even bad, racist mistakes, for you, sisterfriend, and other white persons along an imperfect lifetime’s path and journey because healing and recovery from racism and dealing with white privilege is an imperfect lifetime’s path, journey, and recovery, Progress not perfection is the key-it is so okay, alright, and normal to be imperfect as a white person, sisterfriend. I can just see in my mind’s eye and imagine when I pray and meditate thinking, doing, and feeling the very same things if I were a white woman. Precious and dearest and darling Wendy Jane, it makes so, so very much perfect sense that you, precious white sisterfriend, and other white persons would think, feel, and do the things all of you do and have done because of the white processing, white conditioning, and white enculturation along with white privilege, my friend. Sister, I would think, do, and feel the very same things I can see in my mind’s eye and when I pray and meditate as I imagine then being a white person, in particular a white woman if I were a white woman. I will For Always so, so very, very much love and so, so very much cherish you, Wendy Jane, and other white persons as the beautiful inside and out children of our Good God who all of you are, very, very especially you, Wendy Jane, and other white women as the lesbian black woman who I am!!!!!! I will For Always love and cherish all of you as white persons, and I will For Always have complete confidence in each and every one of you, see such great good inside of all of you, and see such potential in each and every one of you as white persons, and I will never ever give up on you, sisterfriend, and on other white persons despite white privilege, and no matter how many mistakes, even bad, racist mistakes, you, sister, and other white persons make in thoughts, words, and deeds, my dearest friend!!!!!! No matter what For Always, Wendy Jane!!!!! 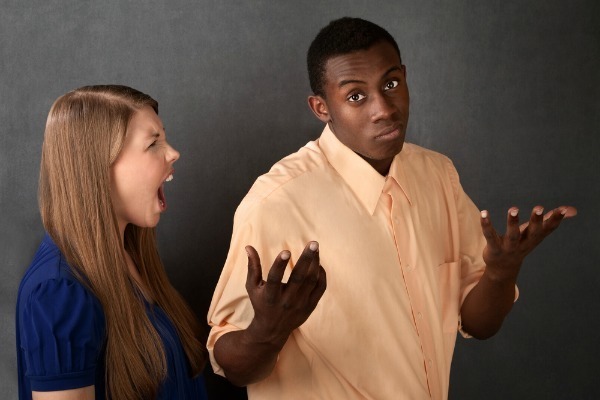 Sister, I know what you mean about black parents warning their sons about avoiding white women and white girls, and even their daughters. My eldest brother, Joe, is 60, and my next oldest brother, Tony, is 59. I am 53 and the youngest and the only girl (alas, I am getting older, sisterfriend-I turned 53 on Sunday, February 22, 2015 which is also George Washington’s birthday-SMILE!!!!!!!). I don’t have any sisters-that is to say, any biological sisters because I DO have sisters like you are to me my dearest and darling white sisterfriend who you are so, so very much, Wendy Jane. I am estranged from my family of origin and I stay away from them to keep me safe and protected-grew up severely abused in every way and a lot of problems and family dysfunction, plus they rejected me when I came out to them and told them that I am a lesbiam but I will for always love them so, so dearly but to stay safe from their violence I don’t have contact with them. Joe and Tony would have interracial heterosexual relationships with white women in their teen years and in their adult lives, and I would very, very often get crushes on their white girlfriends and be so jealous of my older brothers!!!!!! Our parents were not happy that my older brothers had interracial relationships with white girls as teens and white women as adults, and give them stern warnings. I received warnings as well because my parents did not like that I had so, so very many white girls as a child and white women as friends as an adult, and even when they knew that I am a lesbian, they were already upset enough that I am a lesbian but they also were perturbed that I love so. so very much and exclusively and only prefer white women, and how I am so, so very, very intensely attracted to white women for I love so, so very much white women as people and care for white women so as well as being very, very intensely attracted to white women. Our parents were not happy and thrilled with the three of us!!!!!! I resisted the hateful and bigoted messages and warnings from my parents and remained so, so very true to my very heart for white women are my very heart!!!!!!! Wendy Jane, you have just made my day, and made my day even brighter with this so spectacularly courageous, honest, loving, caring, and sensitive blog post article of yours, my dearest and darling white sisterfriend who you are so, so very much as the incredibly amazing, wondrously wonderful white woman who you are For Always so, so very, very much indeed!!!!!! Oh, sister, I almost forgot to tell you-you may know about this show already but there is a cool show on the Lifetime channel tomorrow on Wednesday with repeated episodes from 10:02P.M. Eastern Time to 12:02A.M Eastern time(seems like odd times but I have Direct TV and that is what their guide said)called Kosher Soul and it is about a wondrously wonderful white and Jewish woman who married a black man, sisterfriend!!!!!!!! It seems like such a cool show, my dearest and darling white and Jewish sisterfriend who you are so, so very much For Always, Wendy Jane!!!!!! Sister, please have a so, so very thrilling and terrific Tuesday, my so, so very good friend!!!!!! As always, thank you so, so much for sounding in. I feel so honored to hear more about your family life and remember you sharing about your brother’s interracial dating and your parents disapproval of that, as well as of your friendships with white girls and women. You were strong and true to yourself to be who you were and are and to live your life in harmony with white people who you always share passionately about–your love for them, and especially for white women, for which I am grateful, and grateful for your forgiveness and encouragement to keep going on my journey of self-reflection, sharing and reaching out to have these interactions across color lines. Thank you, my sisterfriend, and thanks so much for giving me the heads up on that tv show, Kosher Soul–I didn’t know about, and hope to catch it.